Trendy knit straps add interest to the neckline of this casual top. A hint of the same straps at the hem complete the look. This design is a simple, lightweight top that can be worn on its own or over a swimsuit for a fun, cute cover up. Effortless style with casual femininity was the inspiration for this raglan-style tank top. 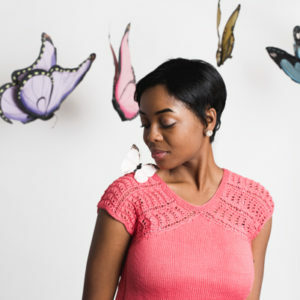 The lacy border and a fitted silhouette combine with a flattering raglan shoulder line and a diamond-shaped aperture to create plenty of visual interest in this fun-to-knit project. Feminine and easy to wear, the Rippling Waters Top is a lightweight sleeveless piece playing with transparency and lightness that can be used as a beach robe or as a summer top/poncho. Welcome the warmer weather with this A-line tank, updated with striped side panels. Its timeless quality increases its versatility: paired with shorts for a day at the park or capris for a night out. With its simple pattern and construction, it’s an ideal portable project. This deceptively simple top is an easy-to-wear, contemporary design that showcases a lattice and fan-lace shoulder. 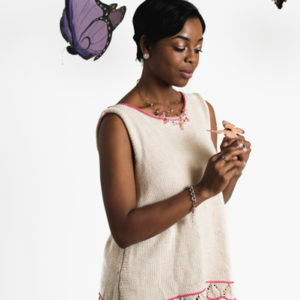 The exaggerated raglan decreases form a butterfly-like line that gives this must-have top an added dose of elegance. A top-down raglan tee is perfect for the rare sunny winter day. Layer it with your favorite jacket for added warm without the bulk of sweater sleeves. The mock cable patterns are fun to knit and give make for a simple and stunning result. Enjoy this tee from winter well into spring.